Onboard components comprise of IDE RAID, Intel 10/100 LAN and 5.1 audio. If that's not enough for you, there are five PCI's and the ever useful CNR slot. 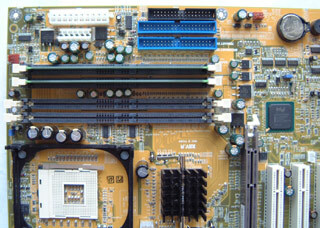 As you can see, the NT72-SA is a very plain motherboard. DFI know that their customers are more interested in functionality and price more then flash. 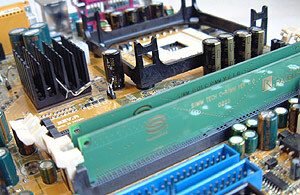 It's nice to see DFI place the main IDE/floppy drive connectors as well as the main ATX and auxiliary power connectors to the right of the DIMM slots - in this position they are not in the way of the other expansion cards in the computer. 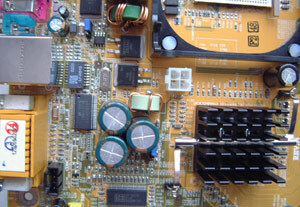 The board requires all three sets of power cables, including the older AT style power connector by the main 20-pin ATX power connector. 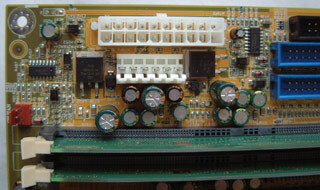 All three fan headers of the board are easily accessible which is extremely helpful. The front panel LED's are also quite well labelled, you shouldn't need to refer to the manual when you're installing them. While working with the NT72-SA motherboard I noticed that half the components were well labelled (like the primary IDE channels) while the rest were not (like the RAID IDE channels). These days it seems, computer users are more spoiled then in the past and having to manipulate jumpers can be a real chore. It would have been nice if DFI could have incorporated these jumper settings into the BIOS. Lastly, because of the rather large PCB, users of mid tower ATX cases or smaller may have a difficult time installing the board into their case.